Get ready for spring everyone, because the sound of it belongs once again to pop-punk. 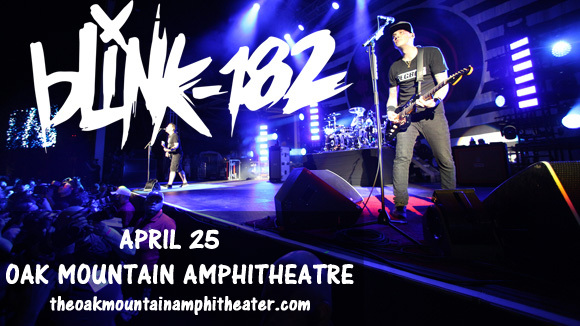 Blink 182, accompanied by The Naked and Famous & Wavves as support, come to the Oak Mountain Amphitheatre on Tuesday 25th April – grab your tickets ASAP because they won't last long! Known for their high energy live performance and tongue-in-cheek humor, the band first rose to prominence in the early 90s with their first album “Cheshire Cat,” and quickly gained a devoted following worldwide. With their poppy melodies against punk-rock style instrumentation and arrangement, the band had more initial commercial appeal than their predecessors, and are now considered one of the pioneers of the pop-punk genre. Blink-182 saw plenty success in 2016 and seem set on pushing that as far as it will go. They hit No.1 with “California,” their 7th studio album, with two singles “She's Out of Her Mind,” and “Bored To Death” reaching number one on Alternative Rock Radio. The Naked and Famous are a relatively new band, formed in 2007, but the indie-electronic act have been active and steady since their formation, releasing one album every three years since 2010. Their most recent, “Simple Forms,” which they will be promoting on tour, will be a huge crowdpleaser in concert – listen to “Higher” and hear the massive anthemic choruses contrasted with the softness of the verse! Final support act Wavves, formed by singer-songwriter Nathan Williams in 2008, are more similar to the headliner, with drawling, nasal vocals over droning guitar and bass lines. No doubt fans of Blink-182's sometimes not-exactly-cheerful will be very taken indeed with Wavves' bleak, spaced-out constructions. This is going to be a big show so don't miss out – get your tickets NOW!